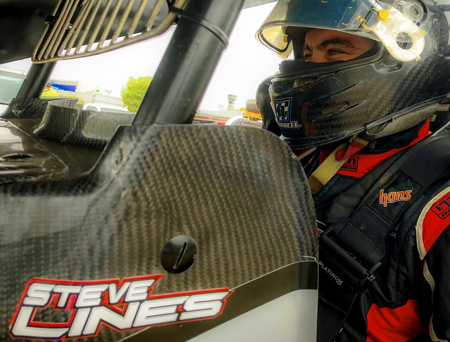 Feb 7, 2019 - Former World Series Sprintcars Champion, Steve Lines has officially made the 2018-19 competition a three-way battle with his nomination yesterday for the final rounds of the series at Albany and the Perth Motorplex. “Put simply, Steve Lines has been sensational over here, and we’re so excited that he will return to play “the spoiler” as he sits second in points despite being a non-contracted driver.” He’s brave, he’s smooth and he’s not scared of the highline which is why he’s been so good over here,” Migro said, highlighting Lines’ pair of impressive wins at both Albany and the Motorplex in World Series competition. Albany Speedway Media Manager and track commentator, Cameron Newbold echoed Migro’s excitement at the announcement. Lines is just eight points behind series leader Kerry Madsen who returns to the Motorplex as the reigning West Australian Sprintcar champion and to the home state of his team, Krikke Motorsport. Madsen has won on three occasions at the Motorplex in World Series competition, ironically playing the spoiler as a non-contracted driver before returning to race in the United States. Madsen’s first WSS win at Kwinana Beach was in November 2007 driving the orange Jeff Leisk owned HSE Rental #29 where he topped a stellar top-five of Donny Schatz, Brooke Tatnell, Jason Johnson and Dave Murcott, back when the series began in Western Australia for two concurrent seasons. His next win would come in 2014 for Keneric Racing, again with a #29 on the tail tank, before returning with Keneric for the second last round of the series in 2017 with the #A1 to claim his third win, only to have James McFadden better him the following night at the Grand Final to win his first World Series round at the Motorplex. McFadden carbon copied the feat last year at the penultimate round, before the racing between he and Madsen the following night came to a disappointingly abrupt end as the pair crashed out while battling for the lead and into the path of an upside-down Lisa Walker. Neither McFadden or Madsen have won at Albany however, and in light of Lines sitting in the box seat to secure a hattrick of World Series wins at the Atwell Park venue, the time is ripe for Lines to capitalise on his Albany successes and mount a strong challenge for his second World Series title.